Mental Exercises are just as important for dogs as they are for people. Not only does mental stimulation keep us all a little sharper, but it also makes us much happier. Most dogs were bred for a purpose. When that purpose is taken away from them, they are left floundering. That sense of purpose typically needs some mental stimulation. Retrieving downed birds, herding cattle and sheep, etc. All of those activities require the brain to be firing. Using the dog treadmill is an obvious way to stimulate the brain and get the endorphins going. Think about yourself. When you are working out and ‘in the zone,’ your brain is functioning simply to keep you going and you aren’t floundering around in boredom. Aside from the dog treadmill, here are some other activities to stimulate your dogs brain. Even though some breeds, like the German Shepherd, have much stronger tracking instincts and were bred specifically for this purpose that doesn’t mean that all dogs won’t be stimulated by a good game of treasure hunt. Find something that they really like, such as a treat or a Kong toy. Let them sniff it, sit and stay, and then make them go find it. It is as simple as that. They will get the reward at the end and the pleasure of knowing that they had to work to get it! Every dog can learn a new trick, even if it is a simple one. This is a great way to stimulate their brain, make them more obedient (subsequently safer), and help really build up the bond that you two have with one another. This is also a great rainy day activity when you can’t get out and do things outside. Start teaching her how to play the game of flyball. You can teach this indoors and don’t have to have a lot of space to do it. This is a great game and about as much mental stimulation as you could ask out of your dog. Please read the link for more info on how the game works. At this point, you have probably taught your dog plenty of cool tricks and she probably knows the names of lots of her toys. Why not take that one step further and make her learn the names of them individually? That way she can she can go and get just the right one at the right time? Watch the following video and come up with some of these cool dog games. 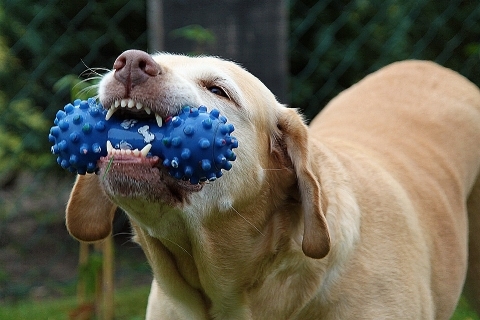 These are great indoor dog games for you to play with your dog. This is a pretty cool game to play with your dogs. Just watch the video and see that your dog can play and engage with the muffin tins.